i like my little yarns, so i'm thinking of posting an older one every now + then to sort of fondle it with my eyes. someone else bought this set and i never got to see (at least, yet!) what, if anything, they turned it into...we get kind of attached to these creations, especially if we were trying to accomplish something with them, learn a new technique, say something. for anybody who doesn't know, this is yarn. 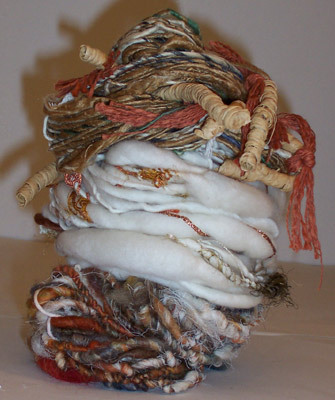 they are created from fibers such as wool, linen, silk, and spun on a spinning wheel to create a continuous length. just as people have been doing for zillions of years. and so much string has disappeared that we don't always realize how much cultures communicated with and via string. but i think we know it in our bones, at least women do. i have been meaning to mention a couple of neat sites. one is this great reference for all things sheep ! another is the fiber femmes online newsletter, a different perspective on spinning, often written from the perspective of the people who raise animals. and last, please check out all the images here at the yarn museum, and submit submit, submit!!! thanks!